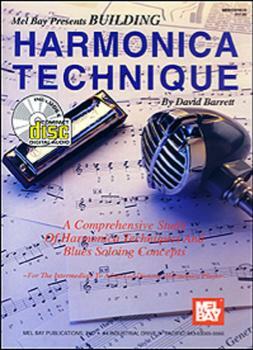 Offering a comprehensive study of harmonica techniques and blues soloing concepts, this book contains studies and etudes on bending notes (draw and blow), throat vibrato, two-hole shakes, tongue blocking, acoustic and amplified playing, music theory, blues scales, octave substitutions, playing positions, and position substitutes. Intended for the intermediate to advanced diatonic harmonica player, this book provides extensive instruction on lead and accompaniment playing styles. The companion CD includes musical example and play-along songs. Each exercise is played and every full length song is fully accompanied by a blues band. Each large example is played once with harmonica and again with accompaniment only. This book can be used with both diatonic and chromatic harmonica, but us more recommended for the diatonic player.